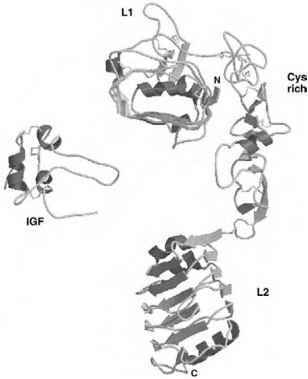 Figure 2 Structure of the fragment, L1-Cys-rich-L2, of the IGF-1R. 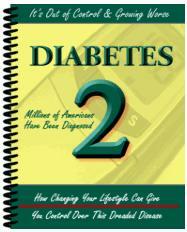 Helices are depicted as broad ribbons and P-strands as broad arrows. Also shown, to scale, is the ligand IGF-1. dimer is critical; it seems that the C termini of the two a-chains must be in close proximity for effective high-affinity binding to insulin. 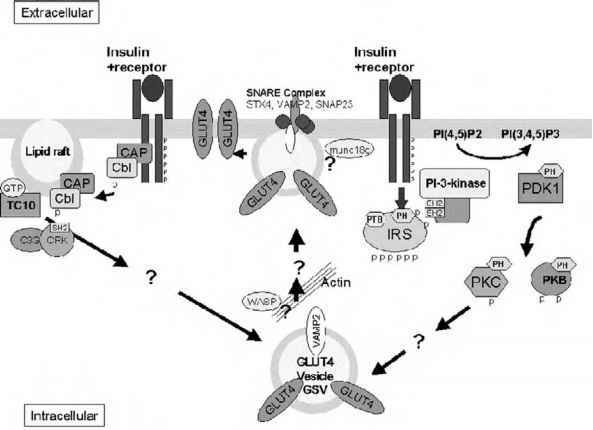 Figure 3 Putative signaling pathways involved in insulin-stimulated GLUT4 trafficking. C-terminal fragments of the IR comprising two or three FnIII domains and including this 16-residue segment of the a-chain do not bind insulin . Although each a-chain of the IR has all the determinants necessary for binding of insulin, high-affinity binding requires two a-chains held in appropriate juxtaposition by at least two disulfide bonds between these chains and by a single disulfide bond linking each a-chain to a P-chain that is itself anchored to the cell membrane. This suggests that two aP monomers are involved in binding a single insulin molecule, thus providing a cross-link between the chains in addition to the disulfide bonds. A significant observation is that the IR undergoes an obvious conformation change (Stokes radius from 9.1 to 7.5 nm) on binding insulin . The nature of this change is unclear, but it may in some way bring together the two kinase domains of the homodimer so that the activation loop of one is accessible to the active site of the other. Such a movement may be equivalent to that observed for other receptor molecules, such as the EGFR, that undergo dimerization following ligand binding, resulting in activation of the receptor tyrosine kinase. Full details of the binding of insulin to its receptor and the subsequent conformation change will probably not be known until crystal structures of the receptor with and without bound ligand are available. Activation of the IR kinase is accompanied by autophosphorylation at up to six tyrosines which both further activates the kinase and creates binding sites for signaling proteins, which in turn become phosphorylated and bind their downstream targets.